Whether you’re in a management position or not, having the right team that is motivated to work effectively is incredibly important. 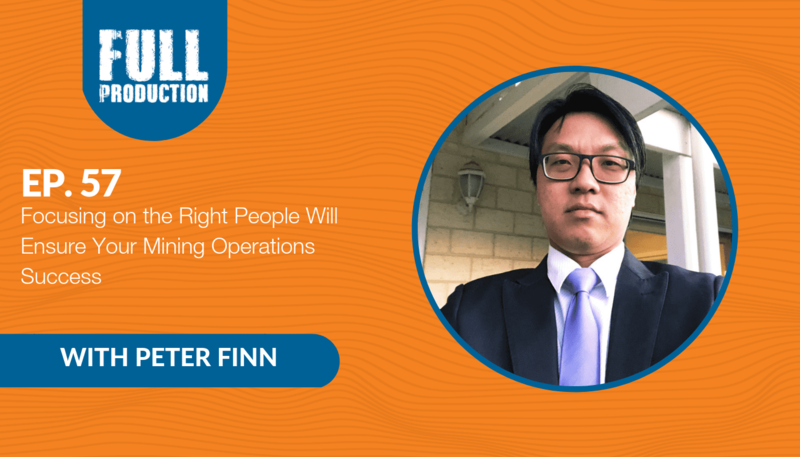 On a recent episode of Full Production, I got talking to a friend of mine, Aaron Teo who is an experienced business development manager at Avid Group. Aaron knows how to sustain a happy, inclusive workforce that has longevity at its core. We all want the mining industry to be sustainable for the future – this is why it’s important to make sure you have the right infrastructure in place. Aaron’s motto has consistently been, “always have the right people around you.” You want to know that you can trust your team and that the quality of services you are delivering is high. When this is the case, you won’t be putting forward people who perform an inferior job, which then subsequently needs to be rectified further down the line. Aaron knows his workforce is highly effective and flexible due to his cross-training tactics – this makes his onsite and workshop planning much easier. That being said, he also takes into account the individuals’ personality – such as reluctant early risers – and tries to accommodate to that too. “Going the extra mile,” a term that has integrated itself into the set of core values within industries worldwide. In this point we’re not talking about customers or clients, in fact, it is related directly to your team. Aaron tries to remedy low staff morale by being appreciative of what his team does for him and creating a family-like environment. He tells me about picking some figs from his garden and gifting them to an employee. It’s a small fruity token to show that the appreciation he has for his peers is real – you can see it and touch it, it’s a physical tangible thing, “It’s all in the senses, you know.” This unabashed appreciation is probably a major factor in his low staff turnover. What’s making Aaron nervous about the industry is the cost of human life versus profit and gives the example of the tragic deaths of miners in Brazil, which was possibly down to poor planning. With the spike in iron ore prices, he worries this could become a trend, pushing global mining companies to press for faster production. This quest for profit is always at the expense of the workers and their families, resulting in an increase in mental health-related issues, disenfranchisement of workers as well as potentially avoidable fatalities. The global mining industry needs to value and support its workers if it has any hope for sustainability moving forward. We need to address global mining health and safety practices as well as our individual workers morale and mental health – putting people before profit. Check out our entire conversation here.